The discord between Turkey and Greece has grown deeper and wider over time, over a series of seemingly vital issues, which have at times brought the two countries to the brink of war. Yet in 1999 the two countries opened a dialogue on non-sensitive issues such as trade, the environment and tourism. 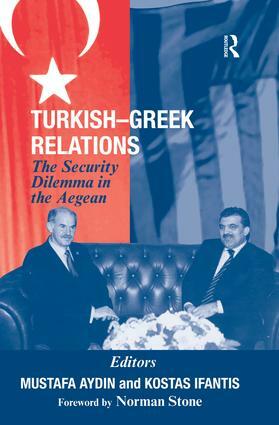 The causes of the current rapprochement progress are explored in this book in relation both to the international environment which is increasingly conducive to this progress, and the significant domestic changes that both Greece and Turkey have experienced since the end of the Cold War. This book confronts each of these important dimensions by addressing issues of continuity and change in Greek-Turkish relations. Mustafa Aydin is Associate Professor of International Relations, Ankara University. Besides his authored books, he is editor of the Turkish Yearbook of International Relations, and the Review of International Affairs; and is currently co-editing two volumes on different aspects of Turkish foreign policy. Kostas Ifantis is Assistant Professor of International Relations at the University of Athens; and Research Fellow at the Hellenic Foundation for European and Foreign Policy. His publications include: Theory and Reform in the European Union, and NATO and the New Security Paradigm: Power, Strategy, Order and the Transatlantic Link.